The next Knoxville mayor will get a $12,500 pay raise, the Rogers Group, Inc. will get a contract of more than $7,467,712 for street paving, and the city’s Wayfinding Project will increase the contract to Jarvis Award, Sign and Flag Company by $23,952. 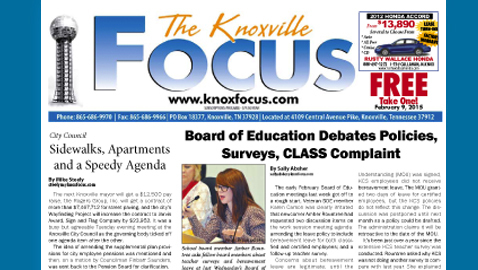 It was a busy but agreeable Tuesday evening meeting at the Knoxville City Council as the governing body ticked off one agenda item after the other. The idea of amending the supplemental plan provisions for city employee pensions was mentioned and then, on a motion by Councilman Finbarr Saunders, was sent back to the Pension Board for clarification. The council also approved payments in lieu of taxes for the proposed Tennessean Hotel at 531 Henley Street, which may have 72 guest rooms and 12 residential apartments. Attorney Arthur Seymour, Jr. told the council the project is facing some 500-year flood plain restrictions and being held up by FEMA. The city is supporting the proposed hotel development because of changes in the flood plain by FEMA in October of 2013 which also affects the convention center. The council also approved the “in Lieu” of taxes for Guyot Properties, LLC., for the construction of a brew pub and restaurant at 100 South Broadway. It is an unusual event when two different neighborhoods ask the city council for opposite things. The Inskip Neighborhood Association asked that a zoning change not take place to allow for a large apartment complex; the Bearden Council asked the council to ask the planning commission to rework the Bearden Opportunities Plan to allow for apartments. Quint Bourgeois, owner of just over 4 acres along Bruhin Road across from the Inskip Pool and Park, told the council that he was not notified of plans to rezone the neighborhood from R-2 to R-1A and asked to be rezoned back to R-2 so he could build more apartments than the 6 per acre allowed in R-1A. The change would require altering the One Year plan there and the North City Sector Plan. The planning commission had voted to deny this zoning change and the property owner was appealing to the council. Several neighborhood residents spoke in opposition to the retro-rezoning, including Jennifer Mirtes of the Inskip Park and Pool Neighborhood Watch. She said that 100 local home owners signed a petition against rezoning to allow a larger apartment complex. The council asked Bourgeois if he would like the matter to go back to the planning commission but he indicated he did not. He said he has more than $200,000 invested there and, had he known of the mass zoning change, he would have asked to opt out and remain in the zone that would have allowed for more apartments per acre. The council learned that Bourgeois can still build apartments there but would be limited to 6 per acre and that he had received a “use on review” at the planning commission. When discussion ended, no one on the council offered a motion and the request was denied due to lack of action. Speaking from another part of Knoxville, Terry Faulkner and Jim Aldridge requested city council ask the planning commission to look at possible rezoning in the area defined by the Bearden Opportunities Plan. The idea is to allow residential development and offices occupy the same site and amend Bearden’s One Year Plan to change classification of property there. Councilman Duane Grieve said that several people are interested in developing an area in Bearden as mixed use. “The way it is set up right now we can’t have apartments there,” Grieve said. He also added an amendment deleting several words from the plan that will go on to the planners. The amendment and the motion passed. The council also voted on two sidewalk issues: one to research Cedar Lane and the other to add money to the Sutherland Avenue sidewalk project. “Do Something About This!” was written on a poster board and placed where Cedar Lane crosses the railroad in Inskip. The sign only lasted a few days and disappeared but it called attention to a dangerous pathway along the south side of the busy street with no sidewalk. Tree roots and dirt along the hillside at the edge of the road cause many people walking to businesses on west Cedar Lane to walk along the street there, dodging traffic. A sidewalk study was approved and the mayor authorized to sign an agreement with Vaughn & Melton Consulting Engineers for $93,400 to study and design a sidewalk along Cedar Lane from Pratt Road to Haynes-Sterchi Road. The design will account for the railroad crossing, as well as drainage, utilities, ADA considerations including side slope, and private property/right of way considerations. The contract also includes preparation of construction documents and construction administration, according to Jim Hagerman, the Knoxville Engineering Director. About $2,900,000 is planned for consulting and actual construction of a sidewalk with about 80% of the funds coming from federal funds.